I am very excited to introduce Charlsie to everyone this week and to be able to share this a beautiful group of her cards with you here today. Charlsie does not have a blog so be sure to say hello and leave your comments for her here at the end of this post. Today Clear Dollar Stamps is sponsoring us with a $15 gift certificate! 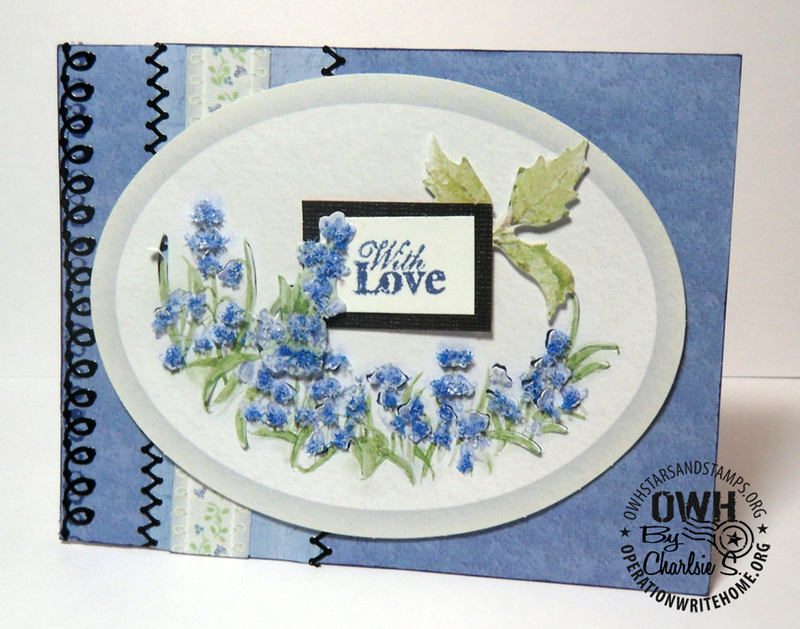 The challenge is open til Sunday night – so CASE one of Charlsie’s beautiful cards, share it using InLinkz at the end of this post! A winner will be drawn Sunday night from all cards posted. Thanks CDS! I have been sewing and quilting for many years. Have always loved crafting. 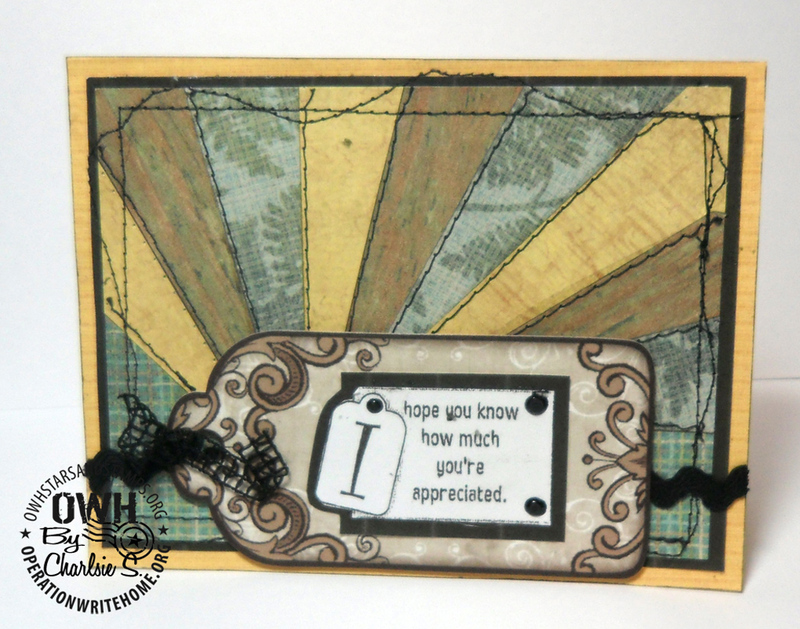 Started stamping and making cards maybe 6 or 7 years ago. I have a sewing/ craft/ computer room that I do all my crafting. It is small but it works. No favorite products really. I like birds and butterflies. Also Hero Arts flower stamps. Because I do not have a craft store in Napa I get supplies from www. paperwishes.com. And they have a websoide every Tuesday showing new products and how to use them. They are very helpful. No favorite technique but really enjoy learning from OWH tutorials. Colors really depend on what paper I grab that day. 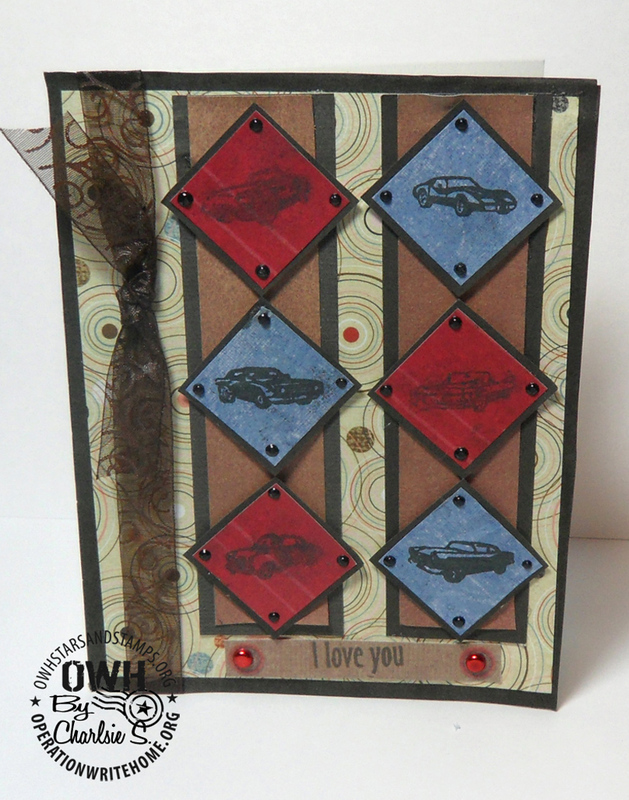 I find it hard to make masculine cards so I try really hard to always add some to the box. Still have the Paper Crafts May/June 2010 magazine with small article about Operation Write Home on page 14. That is when I learned about OWH. What motivates me is knowing how happy a family member must feel getting a really nice card from their love one. I just returned from Florida yesterday visiting our Grandson who is in the Air Force. We were there celebrating his 22 and his Dads 50th Birthdays. Great cards! I can't wait to CASE them! Keep up the inspiration. Charlsie, your cards are absolutely gorgeous!! So detailed!It will take me a level up to CASE your cards. Thank you! Wonderful cards Charlsie, I especially like the last one with the big flower, wow! 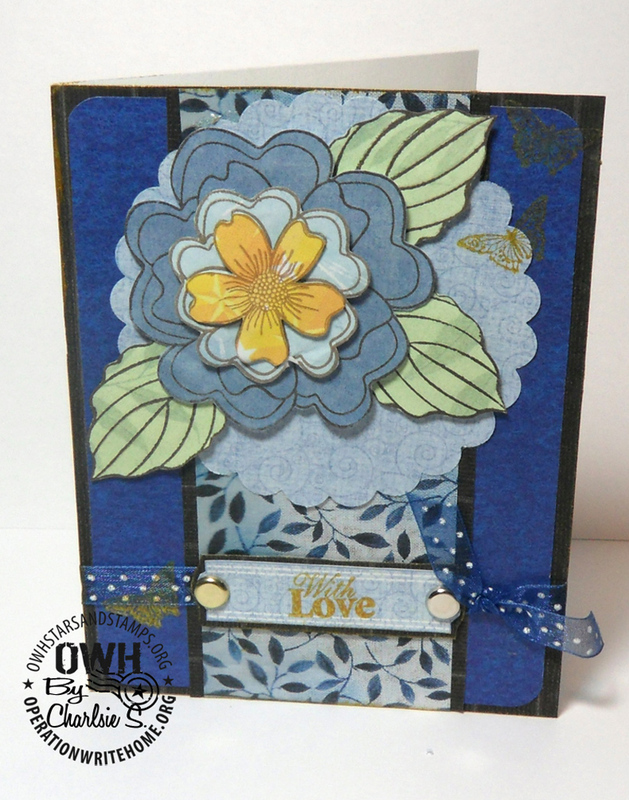 This is a gorgeous group of cards Charlsie! Every single one of these has little details that make it special and you have a great eye for combining colors and patterns. 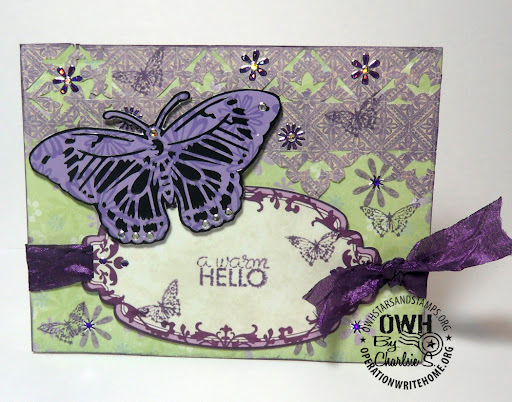 Thank you for letting me share your cards and your OWH story with everyone this week. These cards are beautiful..thanks for sharing. Love your cards. The stitching on them is so pretty!! I especially loved the blue flowers, but they are all beautiful! 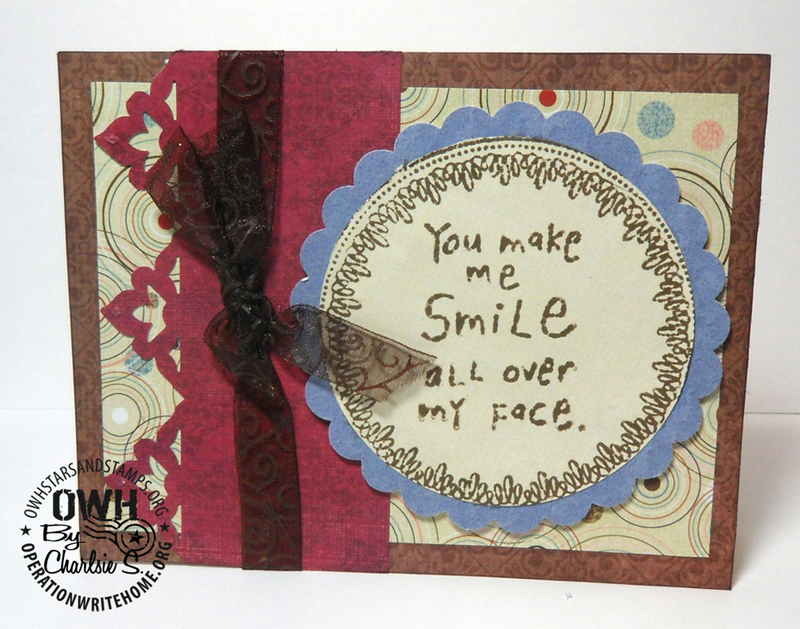 !Pat K.
Charlsie, I love your cards! So beautiful and thank you for letting us CASE one for the challenge. I've been working on a CASE of the last one. Love it! Will be posting mine soon to my blog.